The Polygomma™ Bonding Adhesive (BA) is specially designed to splice the joints and to bond the Polygomma™ EPDM Roofing Membranes and Polygomma™ EPDM Pond Liners to various substrates in case of full bonding. Clean the surface thoroughly to remove any dirt, etc. Ensure that the surface to be bonded is clean and dry. Buff the splice joints/surface of membrane that needs to be bonded – Very important. To apply Polygomma™ BA, pour the adhesive on the membrane/substrate and then spread with the use of a rubber blade/wiper, to ensure maximum coverage. Make sure that Polygomma™ BA is applied evenly on the entire area of both the surfaces (membrane and substrate) and allow it to dry for 5-10 minutes. Polygomma™ BA can be applied on overlap joints using a brush. Join both the surfaces and press well to get a strong and perfect bond. Keep a roller handy and move it over the freshly bonded surface, to ensure that there are no bubbles or trapped air. It is recommended to keep some weight on the bonded surface to get best results. Make sure that the weight does not damage the membrane. Heat of 60 °C (for few seconds) on bonded surface by Hot air will enhance bond strength to great extent. Please note that the maximum bond strength will occur after 24-48 hours, once the Polygomma™ BA is completely cured. The time taken depends on the porosity of the surface. 12 months from date of manufacturing, if stored properly. The lid of the container must be closed tightly and should be stored in a covered shed, away from direct sunlight. Apply and use in dry conditions. 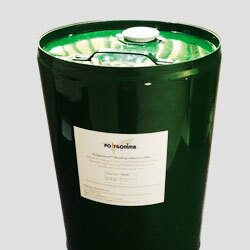 The Polygomma™ Bonding Adhesive (BA) should always be applied on an area of the EPDM membrane which is buffed. Caution: The Polygomma™ BA is hydroscopic and flammable. Please take the necessary precautions during transportation, storage and use. ** The indicated coverage is an approximate for 2 coats (1 on the membrane and 1 on the substrate) of the bonding adhesive. This may change from site to site depending on the quality of the substrate and the applicator/contractor. Click Here to inquire with us about our Splice Tape.